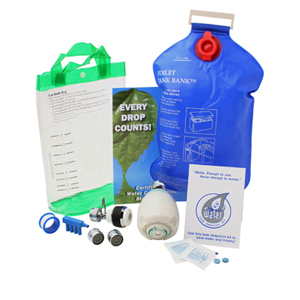 Green Topics - How to Go Green: Cut back on water with easy-to-use kits! Cut back on water with easy-to-use kits! Conserving water is of the utmost importance when creating an eco-friendly home. Niagara Conservation EcoKits are a perfect way to implement conservation solutions throughout the home. Each EcoKit includes a variety of easy-to-install water and energy-conserving products. Each EcoKit also includes helpful, everyday tips for water and energy conservation. They make wonderful promotional tools for your business and can also serve as educational tools to help children understand the importance of saving energy and water with simple but effective ways to do so. Fact - About 30% of a family’s total indoor water consumption is used in the shower. Fact - Faucet use accounts for 15.7% of an average household’s daily water consumption. Fact - You can save over 25,000 gallons of water and hundreds of dollars in water bills and energy costs. And now, Conserv-A-Store is proud to offer our own line of wallet-friendly kits. Make your bathroom the most eco-friendly part of your home with our Sav-Eco line of eco-conscious kits. Comes with two 0.5 GPM aerators and one 1.5 GPM hand-held shower head. But our Sav-Eco kits cover so much more than just the bathroom! If you're looking to help the environment from your kitchen, garden, or anywhere else in the house, then Conserv-A-Store is here to help make sure that both the Earth and your wallet stay filled with green!